This contemporary, Zen-designed, two-bedroom apartment was featured in Decormag as: "A Perfect Urban Retreat." The apartment is located on the 4th floor of an elevator building. Surrounded by windows, it is sure to provide its guests with a sense of freedom in the big city and a spectacular view of Montreal. The kitchen is equipped with high-end appliances, sure to please the most discriminating gourmets... perfect for entertaining your guests. 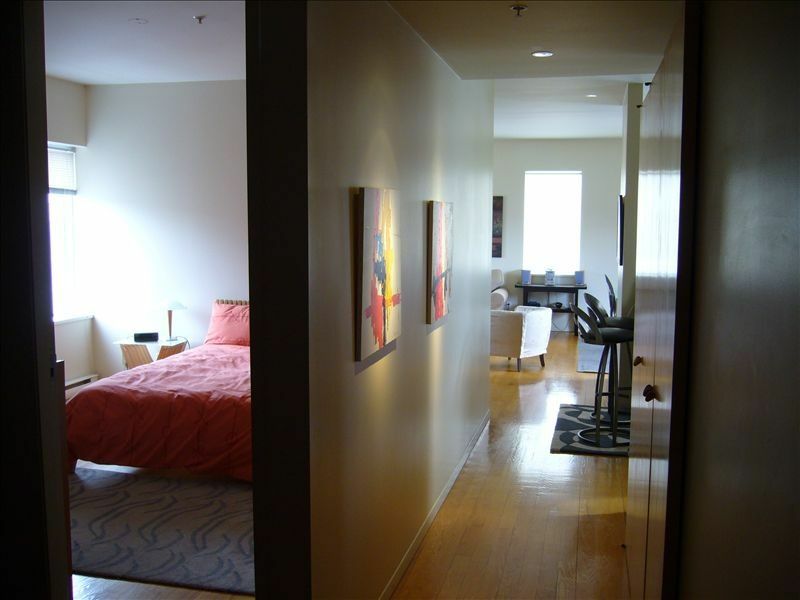 Downtown Montreal, large condominium 4 1/2 all furnished and equipped for rent. For short or long term. Ideal for professional. The closest thing to a European neighborhood square you'll find this side of the Atlantic, Square St. Louis is nestled in Montreal's Latin Quarter near the university and the fashionably bohemian Plateau neighborhood. Indeed, singer and poet Leonard Cohen is rumored to own one of the picturesque townhouses that line either side of the long rectangular park. A classic Victorian fountain is the centerpiece of the park, along with an old gazebo with a small selection of snacks. It is said to be favorite haunt of writers, painters and filmmakers seeking artistic inspiration, but on a sunny day everyone in the neighborhood seems to be there, making it a true town square. The major attraction are plentiful benches, where you can relax, meet your neighbors or just watch as the world passes by. Near all events including Jazz Festival and Grand Prix activities. Located between the bistro's and boutiques of Saint Denis Street and the chic restaurants and nightlife of Saint Laurent Boulevard. The condo is less than 30 minutes walk from many key Old Montreal sites. It was spacious for our family of 4. Our teens appreciated having twin beds in Montreal! Great apartment. Great location in walking distance of restaurants, cafes, public transit, shopping, parks. Everything about the apartment was terrific. Loved the location, neighborhood, layout and space of the apartment. Great park across the street, great restaurants and pastries shops. Only pain was parking but we managed and worth it because of all the other benefits. Great location and well kept apartment. We’d rent again. Clean and plenty of space. Location made it easy to get to Metro, eat out, or buy food to eat in. Owners left helpful information, also. I agree with a previous reviewer who said the apartment could use some refreshing as well as a thorough cleaning (particularly the shower) but, overall, it's a really good space and it's location is excellent. The couches are older and are a little difficult to get out of but the beds were very comfortable. There is a fabulous walk-in closet between the two bedrooms. The bathroom has a pocket door between the toilet and the shower/bath area. The living room is at the far end of the apartment and we didn't hear any of the neighbors. The apartment is on the fourth floor of an elevator building which made bringing in luggage very easy. It is located on a lovely park/square with a fountain, ½ a block from a relatively inexpensive parking garage where we just left our car for 3 days and ¾ of a block from the metro that takes you anywhere in the city. You can get a 3 day metro pass for $18 Canadian. One block in any direction takes you to a whole host of restaurants! The location could not have been any better. I look forward to the opportunity to return some day and enjoy Montreal again!